How big is your Quota? Controlling use (abuse) of server disk space has been high on administrator’s wish list for a long time. Now with Disk Quotas you can implement best practice and limit users’ disk space. Disk usage conforms to the ‘Pareto Principle’; 20% of your users will consume 80% of the disk space. 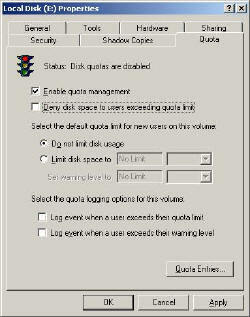 Configure disk quotas and make things fairer, stop one or two selfish users filling up the disk space unnecessarily. One strategy is to set the limits high and use quotas to plant the idea that users should implement good housekeeping with their files. To activate disk quotas: right-click the root of any partition and you will see the Disk Quota tab. If you wanted to use disk quotas on separate folders investigateMount Points. Trap: Remember to check both boxes. I have had several emails saying that Quotas are not working. The reason was the administrator forgot to tick a box. 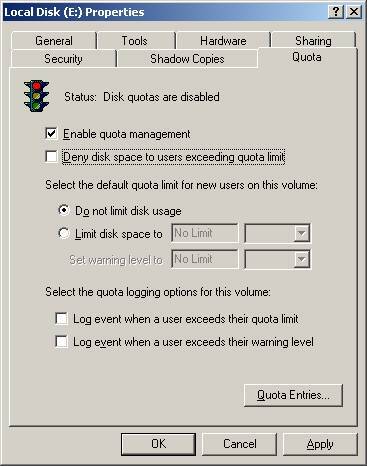 It does annoy me to think of the users ignoring your your limits, so seek out this box: ‘Deny disk space to users exceeding quota limits’. If you tick the two bottom boxes to Log events, then go to the Application log in the event log to check what is happening. There have been several high profile cases of lost laptops containingsensitive information. Windows 2003 offers the facility to transparentlyencrypt sensitive folders. So if the files get into the wrong hands, theywill be very difficult to decrypt. 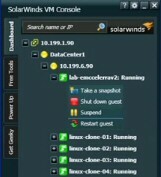 See more on disk troubleshooting. Try another Litmus Test or..See more about disk defrag. An extended partition is a work-around to break the 4 primary partition rule. Logical drives store data like primary partitions, but they cannot be used to start an operating system. Who is looking at your server?